What does it mean to create work that captures the present, rather than a focus on a nostalgic past or a cruel optimism about the future? How is documentary an entry point into ways of seeing the moment we are in and ways of moving through crises together? Speaking about her current feature documentary “Illusions of Control”, Dr. Walsh will discuss the evolution of her methods of storytelling in an age of ecological uncertainty. 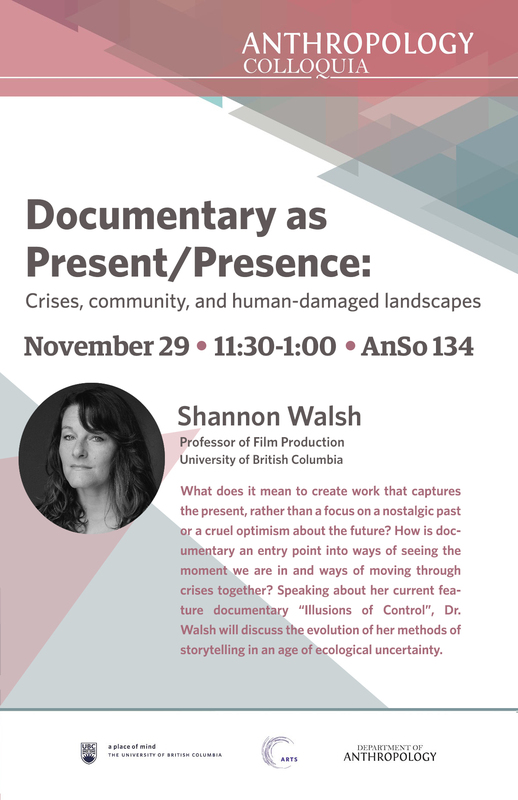 Dr. Shannon Walsh is an award-winning documentary filmmaker with a background in ethnography, visual methodologies, and participatory research. She holds a Phd in Anthropology and Education from McGill University and teaches in the Department of Theatre and Film at UBC. Her current feature documentary “Illusions of Control” is in post-production.